As part of USAID/Guatemala’s Western Highlands Integrated Program (WHIP), the Nutri-Salud: Community Nutrition and Health project, implemented by University Research Co., LLC, works closely with other WHIP partners, government, and civil society. Following a previous Learning in Action article on USAID/Guatemala's perspective on learning within WHIP, Elena Hurtado, Chief of Party for Nutri-Salud, provides insights from the implementing partner perspective. She discusses how the team has embedded collaboration and learning within its implementation as it seeks to expand coverage of quality, integrated primary health care services and engage communities and local government in improved health and nutrition. APRECIE (Aprendizaje Colaborativo e Intercambio de Evidencia y Experiencia), which means Collaborative Learning and Exchange of Evidence and Experience—and also “appreciate” in Spanish— is a key part of Nutri-Salud’s quality improvement approach. In the APRECIE methodology, evidence and experience are gathered through participatory data collection methods for decision-making about program and performance support priorities. Nutri-Salud: the USAID/Guatemala Community Nutrition and Health activity, managed by University Research Co., LLC (URC), is a 5-year (2012-2017) effort, which aims to improve community nutrition and health of women and children in 30 municipalities in 5 departments of the Western Highlands of Guatemala, where the population is predominantly rural and indigenous Maya. Nutri-Salud works to improve nutrition among women of reproductive age and children under five to strengthen maternal, neonatal, and child health (MNCH) and family planning services; and to engage communities in finding active solutions to their health care needs. 1. What was the primary goal of the learning approach/project/event? Using APRECIE, Nutri-Salud defines standards and indicators of prenatal, postnatal, and neonatal child care; measures them in a sample of each type of clinical record; and undertakes planned actions to improve the levels of compliance with these standards and indicators. Likewise, at the community level, indicators on knowledge and practices of mothers are also defined, then knowledge and practices are measured through lot quality assurance sampling (LQAS), and behavior change actions are planned to improve results. To operationalize the methodology, the 30 municipalities in the Western Highlands included in WHIP were divided into 110 supervision areas (SA), each with a population of approximately 10,000, served by 5 health posts and/or community convergence centers. A continuous quality improvement team (CQIT) was formed in each SA, and the team leads the measurement, sharing and discussion of the findings, and the development of improvement plans for health and nutrition activities in the SA. The methodology is already showing positive results. For example, the percent of mothers who could correctly state the ideal birth interval (3–5 years) rose from 57 to 72 percent, and the percent of clinical records showing that postpartum women received a home visit within 48 hours of birth rose from 31 to 69 percent (derived from baseline measurements to the second round of data collection three months later). Improvement plans and activities that CQITs carried out to achieve these outcomes included developing key messages and talks on the ideal inter-pregnancy interval for use at every clinic visit and during household visits. In order to increase early postnatal visits, a “notification chain” has been established in communities where health providers and the health commissions track the probable delivery dates of pregnant women in any given week; as soon as a woman is in labor they are notified via cell phones. 2. What are some lessons learned? 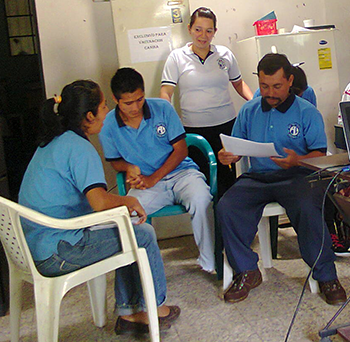 A similar collaborative learning and evidence exchange methodology had been applied prior to Nutri-Salud by URC in secondary health facilities (health centers) in Guatemala. Evaluation found that it not only improved the quality of neonatal and obstetric care, but that providers who participated on the CQITs were very positive about the methodology. CQIT members mentioned that it helped them to provide better services by promoting teamwork and group communication and by focusing work on fulfilling established standards of care. However, providers in the same facilities who did not participate in the CQIT had minimal understanding of the methodology and communication and sharing between team members and non-team members was weak. In order to build a greater understanding among all health providers, not just CQIT members, Nutri-Salud created the name APRECIE to distinguish the methodology from its previous application to maternal and neonatal care (previously called ProCONE for “obstetric and neonatal care and promotion” in Spanish). In its new iteration, Nutri-Salud has adopted the methodology for first-level health services, grouping them by the aforementioned SAs to promote better understanding and knowledge sharing across facilities. 3. What was the biggest value for those involved? The biggest value for those involved is that they can measure their performance, learn from it, and plan improvement. It empowers health providers. 4. Are you attempting to measure learning? If so, how? Yes, Nutri-Salud is planning to have learning sessions where project staff and the CQITs not only discuss achievements based on quantitative indicators, but also assess and discuss learning by participants in the process. Nutri-Salud would like each SA to also become a “learning area” (a learning lab, if you will) through competency-based training, tutoring, and follow-up. This new phase will be called APRECIE+. 5. How are you sharing learning with other implementers, local stakeholders, and/or USAID based in the Western Highlands? Nutri-Salud has shared APRECIE with the Ministry of Health (specifically the Vice Ministry of Primary Health Care) and has now trained the central level Ministry personnel in the methodology. They are extremely interested in expanding the use of APECIE to the rest of the country, although there are resource challenges that constrain a national roll-out. Nutri-Salud has also presented the methodology to rural value chain activity implementers and other USAID health partners. Coordination with the latter group has led to more complete geo-referencing and mapping of their activities in the SAs, which supports coordination between members in the larger USAID Western Highlands Integrated Program. 6. How will this approach/activity/event connect to future project work? Nutri-Salud faces the challenge of monitoring community integrated management of childhood illness (IMCI) and community-based family planning, and will try to do it using APRECIE. The project will also use the LQAS surveys of community knowledge and practices to monitor its renovated behavior change intervention. This activity focuses on a set of 19 behaviors during the first 1,000 days of life (or from conception to 2 years, also called the 1,000 Days Window of Opportunity), using a “behavior wheel” as the main support material at the household level.